Saudi forces Sunday said they intercepted and destroyed two boats filled with explosives remotely controlled by Yemen Houthi rebels who were planning to attack Jazan city port. The navy destroyed the boats, state-owned news agency SPA reported. 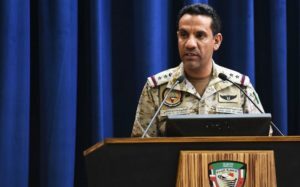 Colonel Turki Al-Malki, the spokesperson for the Saudi-led Arab coalition fighting in Yemen, said the attempt will not be left unanswered, adding that perpetrators and sponsors will be dealt with with iron hand. “Such hostilities cannot go by without holding the perpetrators and those involved in planning and implementation accountable for their actions”, he said. The kingdom has become target of missile attacks by Yemen Houthi rebels who have been fighting against Saudi Arabia-backed President Hadi and his forces. The rebels have flashed out the president from capital Sanaa and have occupied large swathes of the Yemeni territory. Saudi Arabia and its Arab coalition entered the conflict in 2015 in a move to roll back gains made by the rebels who also enjoy Iran’s support. The rebels have stepped up attacks against the territory with missile and drone attacks. Nearly 200 missiles have landed in the kingdom killing more than 110 Saudi citizens and residents since 2015. Written by: KanelkaTagba on October 2, 2018. Posted by KanelkaTagba on Oct 2 2018. Filed under Gulf News, Headlines. You can follow any responses to this entry through the RSS 2.0. Both comments and pings are currently closed.